Judging from the air intake in the logo, these won't be turbo-charged anytime soon. 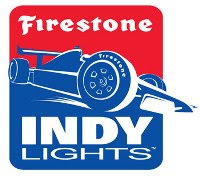 Pairing open-wheel racing's past and present to help mold the sport's future, the Indy Racing League and Bridgestone Firestone North American Tire, LLC announce an agreement which sees the Firestone brand assume title sponsorship of the Indy Racing League's official development series and re-establish the series name as Firestone Indy Lights. "This is a fresh start driven by tradition," said Al Speyer, Executive Director of Motorsports, BFNT. "Our company has a long history of supporting the development of talent in the open-wheel ranks; this will be our 18th consecutive year doing so. With the unification of open-wheel racing, we thought it the perfect time to merge the excitement of the IRL's growing support series with the rich history of Firestone Indy Lights." OK, it's "a fresh start", but is it "a cleaner sheet of paper"?